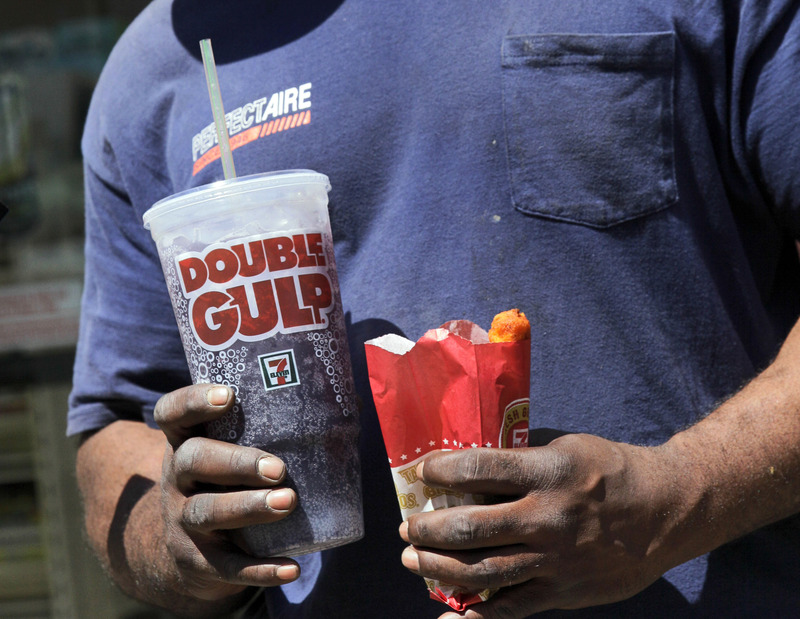 (CBS/AP) NEW YORK - If New York City bans big sodas, what's next? Large slices of pizza? Double-scoop ice cream cones? Tubs of movie-theater popcorn? The 16-ounce strip steak? Opponents of the proposed ban may use that slippery-slope argument along with other legal strategies to try to block the first-in-the-nation rule. Mayor Michael Bloomberg wants to bar restaurants, movie theaters, sports arenas, food carts and delis from selling sodas and other sugary drinks in servings larger than 16 ounces, saying it is a way to fight obesity in a city that spends billions of dollars a year on weight-related health problems. Bloomberg spoke Wednesday to "CBS Evening News" anchor Scott Pelley about criticism of his health initiatives aimed at smoking and obesity. He defended the proposed measures saying "obesity is the largest public health issue around the country but also in New York City." "And we are not banning anything, we didn't ban smoking," Bloomberg added. Whether that's legal, though, is a matter of dispute and all but certain to be tested. "We're going to look at all of our options to protect our business, our rights to do business and our rights not to be discriminated against. We won't take anything off the table," said Steve Cahillane, a senior executive with Coca-Cola. The city Board of Health, appointed by the mayor, is expected to approve the measure after a three-month comment period. It could take effect as early as March, unless the critics who accuse Bloomberg of instituting a "nanny state" can get the courts or state lawmakers to step in. It's not just businesses and industry groups that could sue. In theory, any individual affected by the ban could bring a legal challenge. But it wouldn't be enough to simply claim that the ban infringes on personal freedom, said Rick Hills, a New York University law professor specializing in local government law and New York City. While Bloomberg administration officials say they have no plans to move against solid foods, any local government could ban red meat -- or even all animal products -- without violating a person's right to life, liberty and the pursuit of happiness, Hills argued. "The court has never struck down a health measure that was designed to protect people from unsafe diets or unsafe foods," he said. Whether the ban is on rat poison or on sugar, government is allowed to protect people from themselves, he said. And Hills said that opponents would have to do more than argue that the law affects one source of sugar more than others. Courts, he said, have repeatedly ruled that the government can try to eradicate societal ills one step at a time. Rob Bookman, an attorney who has represented the New York Restaurant Association, predicted opponents will argue that the city Health Department is overstepping its authority and infringing on federal or state power. If this ban is within the city's rights, then there's nothing to prevent, for example, a prohibition on the 16-ounce New York strip steak, he suggested. "We have one federal Food and Drug Administration that determines what products are legal or not legal, or safe for consumption or not safe for consumption," he said. "We cannot have 30,000 or so localities around the country being their own FDAs" without killing the national food industry. At a Board of Health meeting this week, members seemed to suggest they would, in fact, welcome more expansive measures. Board member Bruce Vladeck asked why the city wasn't considering portion-size limits for buttery movie theater popcorn. "The popcorn isn't a whole lot better from the nutritional point of view," he said. In a statement, Health Department spokeswoman Alexandra Waldhorn said the Board of Health's responsibilities include "the control of chronic disease and food service establishments." She added: "Limiting the portion size of sugary beverages served at New York City restaurants is a valid exercise of these authorities." Bennett Gershman, a constitutional law professor at Pace University, argued the ban would afoul of the U.S. Constitution's Commerce Clause. Local governments "can't pass laws that do impose burdens on the free flow of commerce between states," he said. "If it is too much of a burden, the Supreme Court says that states can't do it. Only Congress can impose burdens on commerce. States can't." Gershman suggested the measure would impose a burden by requiring out-of-state companies to produce different size drink containers and offer different services for customers in New York. But Hills scoffed at that line of reasoning, saying the courts have generally accepted such an argument only in regard to transportation rules that might, for example, prevent some trucks from driving across state lines.